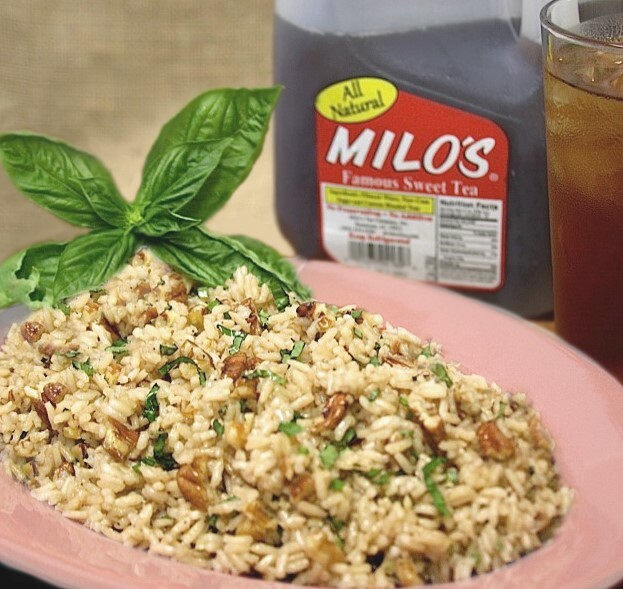 Milo's Famous Sweet Tea and Pecan Rice - Milo's Tea Company, Inc. In a 3-quart saucepan, combine the Milo's Famous Sweet Tea, rice, olive oil or butter, salt and pepper. Bring to a boil. Reduce the heat to low. Cover and simmer for 15-20 minutes, or until the rice is tender and all the liquid has been absorbed. When rice is tender and no tea remains in the saucepan, remove from heat and stir in the pecans and basil. *If you plan on making this in advance, don’t add the basil until you are ready to serve!